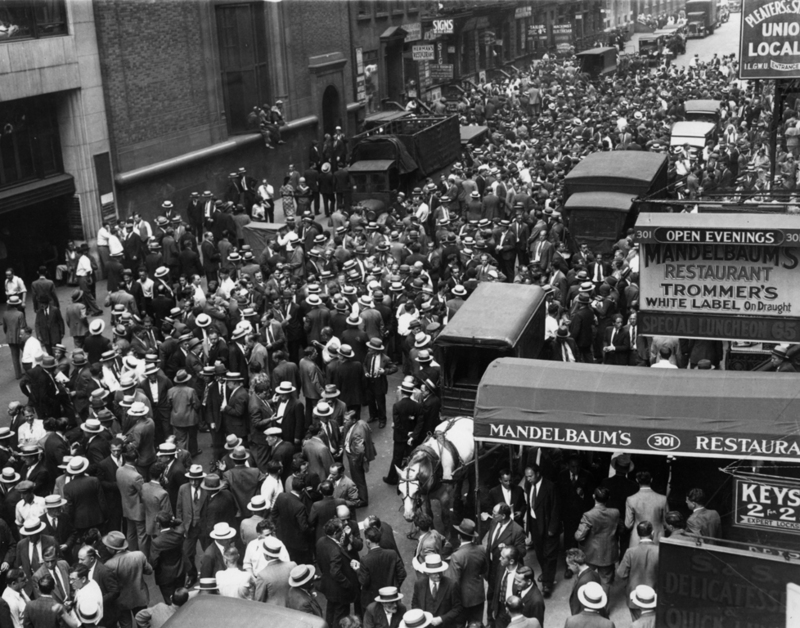 Left: Noontime Congestion on West 36th Street between Eighth and Ninth Avenues, c. 1925, Courtesy of Kheel Center, Cornell University. 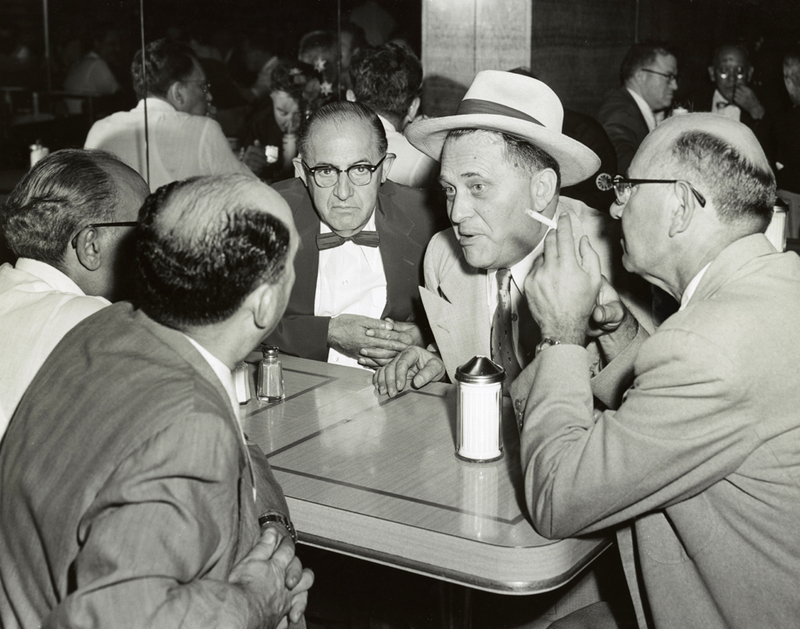 Right: Jobbers Discussing the Businesses During a Break at Dubrow's Cafeteria, 1955, Courtesy of the Library of Congress. 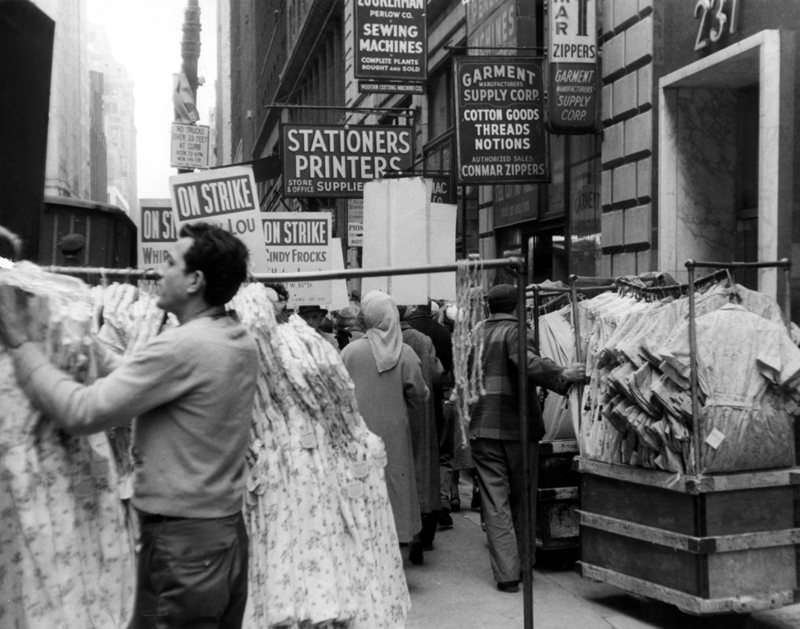 Left: Men Unload Dresses Onto Racks While Workers Picket in Front of the Aronson Building, 237 West 36th Street, c. 1950s. Courtesy of Kheel Center, Cornell University. Right: "Wa-a-atch it! 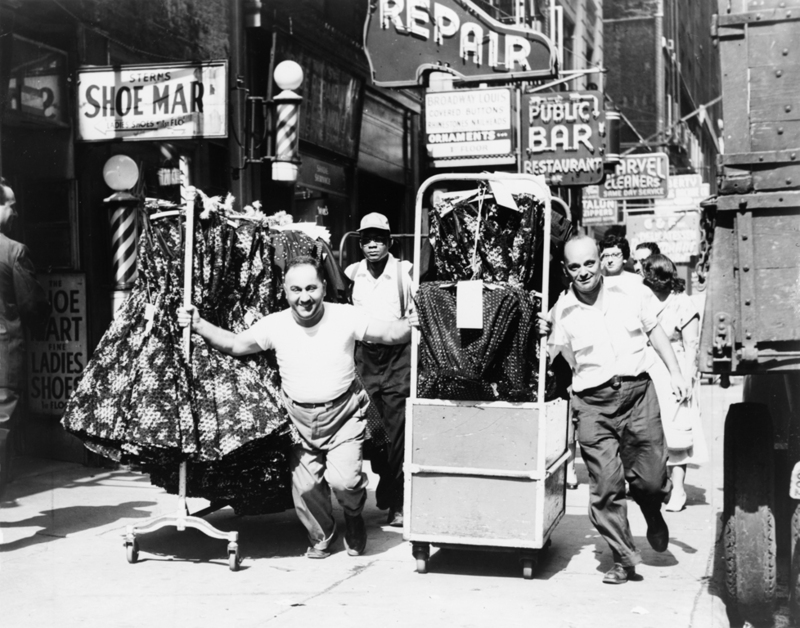 Frock-loaded rack and push-truck barrel down 36th St. Toward Seventh Ave.," 1955, Library of Congress. Fashion has connotations of glamorous pursuits and the businesses involved with the ladies' garment industry exploited the notion that they were creating the clothing that made American women so fashionable. But all of the fashionable clothing worn by American women was the result of the hard work of the men and women who sewed the garments, the entrepreneurs who owned the businesses, the push boys who navigated carts filled with dresses or fabric or boxes through the streets, the men who loaded and unloaded trucks, and many others. Most of the workers in the garment industry have always been immigrants or migrants to New York - Eastern European Jews and Italians in the early years, Puerto Ricans and African-Americans in mid-century, and Asians and Latin Americans in more recent years. 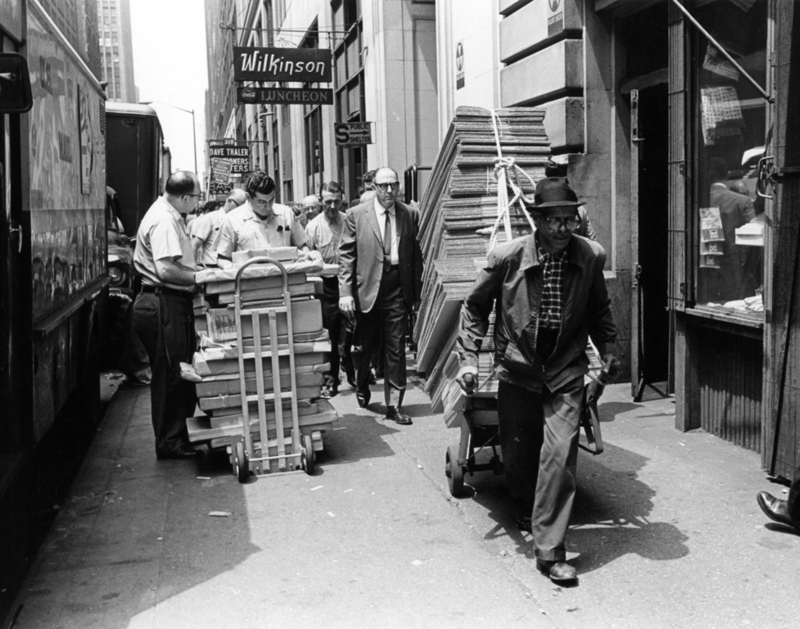 Left: An African-American Worker Pulling a Hand Truck Filled with Boxes, Courtesy of Kheel Center, Cornell University. Right: "Games Replace Garments," 1956, Library of Congress. Shall We Save New York? 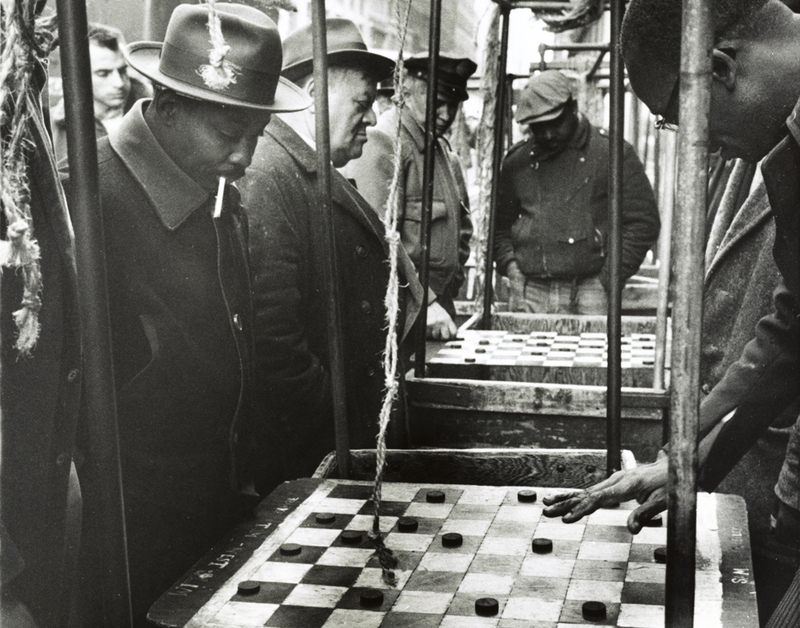 Who Built the Garment District?